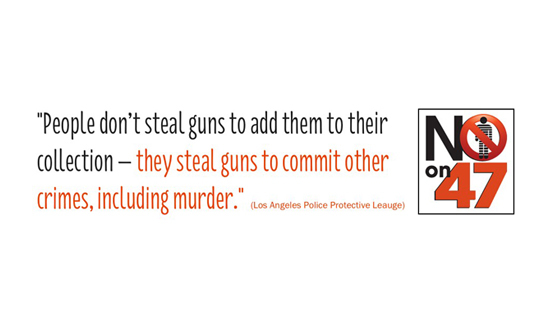 Law enforcement officers in California need your help to defeat Prop 47. If the voters approve the measure, penalties for serious crimes will be reduced and public will be at risk. Read this editorial from the Sacramento Bee to see the urgency and check out this website – Californians against Prop 47. Do whatever you can to help defeat the measure – write an op-ed piece, send money, write a letter, send an email, make a call. Every little bit will help. And remember, what happens in California rapidly moves east. In recent years, Gov. Jerry Brown, legislators and voters have approved far-reaching changes to California’s criminal justice system and cut the prison population. Now, while law enforcement officials still are adjusting to the new order, voters are being called upon to decide Proposition 47, an initiative on the Nov. 4 ballot that would reduce penalties for people who commit certain nonviolent crimes and drug offenses including heroin, methamphetamine and cocaine possession. We urge a “no” vote, in part because police and prosecutors are grappling with the landmark 2011 criminal justice realignment law that shifted responsibility for handling lower-level offenders to the counties. Additionally, voters approved a 2012 initiative reducing sentences for individuals who previously would have been sent to prison for decades under the 1994 “three-strikes” initiative.